There are lifetime’s of fly fishing opportunities within an hour of Bozeman, MT. From the Madison River, to the Gallatin River, to the Yellowstone River, and every small stream in between: the list is endless. It can be overwhelming with all of the great options to decide where to spend your time if you are passing through and only have a day or two to enjoy fly fishing in Bozeman, Montana. While hiring a fly fishing guide is the best way to make the most of your Montana fly fishing trip, it doesn’t make sense for everyone. Want to know where our Bozeman, MT fly fishing guides go fish when we want to stay close to home? Read on for our 5 spots to fly fish in Bozeman, Montana. The town favorite. Fly fishing at the Cameron Bridge is the classic spot to fish for wild trout close to Bozeman, MT on the iconic Gallatin River. The Cameron Bridge is just a short drive west of town and provides great access to many miles of wade fishing on the Gallatin River. While usually crowded close to the access point, the crowds tend to thin out after a short 10 or 15 minute hike up or downstream. Just remember to follow Montana’s stream access law and stay below the high-watermark. 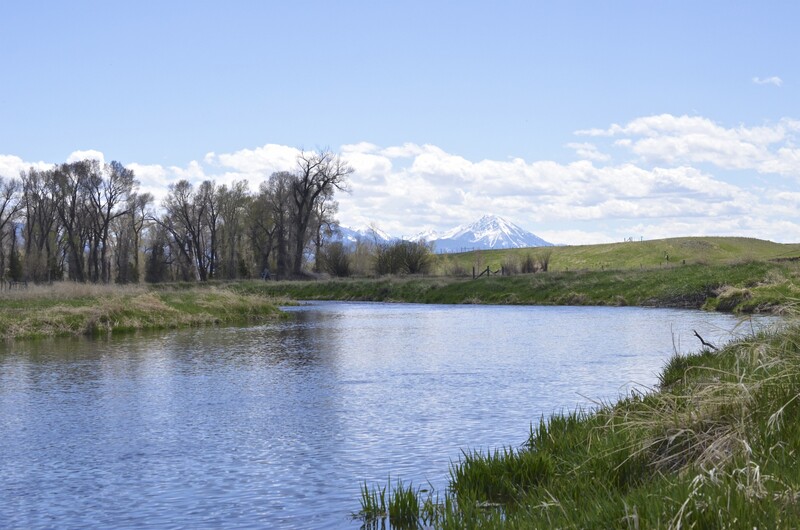 The Gallatin River at the Cameron Bridge is classic freestone river fishing at its finest. Anglers can expect great fly fishing for rainbow and brown trout averaging about 13 inches with larger fish caught regularly. Great hatches from April through October make for excellent dry fly fishing opportunities. The deeper holes are best fished with streamers or nymphs. Head on up the Hyalite Canyon Road to fish Bozeman’s favorite lake. Hyalite Reservoir is just a short 15 minute drive from town, but a world away from the hustle and bustle of Main Street. This lake is tucked away in the high Gallatin Mountains, surrounded by snowcapped peaks for much of the year. There are great fly fishing opportunities for both wade and float anglers on the lake. Yellowstone Cutthroat trout and Grayling are present all across the lake and can easily be targeted at the inlet and outlet as well as the many coves along the south-west shoreline. These fish vary greatly in size from 8-18 inches with larger fish regularly caught in the winter months. That’s right, fishing on Hyalite Reservoir is a year-round option, but leave the fly rod at home in the winter, it is a ice fisherman’s paradise. Small leeches, prince nymphs, midge patterns ,and small parachute dryflies should cover you for fly selection. Head just 35 minutes west of Bozeman to fly fish the Beartrap Canyon of the Madison River. This is the closest wilderness flyfishing experience close to home. The dirt road in ends at a trailhead warning anglers of bears, snakes, and swift water. This fly fishing is not for the faint of heart. Anglers who do venture back are generally rewarded with great fishing in a true wilderness setting. This stretch of the Madison River is chock full of larger than average rainbow and brown trout. Targeting slower, deeper runs, as well as the many larger boulders littered along the river bottom is a great starting point for finding these trophy sized fish. Fly fishing the Beartrap Canyon is a favorite winter-time fishing destination for our Montana fly fishing guides during the snow season. Anglers can expect great hatches of midges all winter long that make for excellent dry fly fishing even during the coldest of days. Primetime fishing opportunities during the spring, summer, and fall are great here with reliable hatches making for some of the most consistent fishing in the area. The biggest and baddest of the brown trout in this river have a special place in their heart for a well-presented crayfish fly. Keep the line tight and hold on! Just outside Bozeman, MT is the sleepy trout town ofLivingston, MT, and just south of Livingston, MT is one of our state’s most famous small streams: DePuy’s Spring Creeks. The creek runs through one ofMontana’s finest working ranches and anglers can expect to pay a daily rod-fee to access the creek, but it is well worth the price of admission. Between the thick hatches, excellent dry fly fishing, great sized trout, and amazing scenery, it is hard to imagine a finer fly fishing destination near Bozeman, MT. DePuy’s Spring Creek is a regular staple on our guided fly fishing trips and for good reason: the fishing is that good. But by good we do not mean “easy”. The water is clear, the flows are slow, and the fish are selective. But good presentations are rewarded with great opportunities. Just don’t forget your 6x and 7x tippet. Not going to give up any secrets here but the East Gallatin River has great fly fishing for anglers in Bozeman, MT as close as 5 minutes from Main Street. But you are going to have to earn it. This small stream courses through the many private ranches north of town, but there is great access at the many bridge crossings and fishing access sites along its length. Anglers that put in the time to learn the character and nuances of fly fishing this stream are rewarded with great fly fishing for wild rainbow and brown trout. Mid-summer hopper fishing can be as good as it gets on the East Gallatin River. Lots of spring creeks pour into this stream along its length, keeping it cold and clear all summer long. And cold, clear water makes for happy trout.